The Aviv Analytical Fast GC is based on a novel, (US patent 8,591,630) low thermal mass fast gas chromatograph (GC) design. It coverts standard GC or GC-MS into a Fast GC or Fast GC-MS while using the standard GC autosampler, injector and detector. It is compatible with standard GC-FID and GC-MS (Agilent 5975, 5977, 7000, 7010, 7200, 7250) as well as with our GC-MS with Cold EI (GC-MS with Cold EI). A) Ultra Fast GC: With >1200C/min heating rate and 20 seconds cooling back to 50C, full analysis cycle time of less then one minutes can be routinely achieved. B) Broadest range of fast GC columns are available: The Aviv Analytical Fast GC can use any standard fused silica column from any vendor. C) Lower cost of columns and use: Column replacement requires only 3 m or 5 m standard capillary column of your choice, thereby costs 10-20% of the price of standard columns (~$40-80) which is far lower than the price of all the alternatives. The Aviv Analytical Fast GC column can also be trimmed at its injector side for further longer operational time. D) Easy column replacement: The column can be easily and quickly replaced by the user. E) Unique top GC mounting - Fast GC and standard GC analysis in a one system: The Aviv Analytical Fast GC column and a standard analytical column can be installed from two separate injectors and connected at their output ends with a T connector into a one detector transferline, thereby enabling quick and automated switching from standard GC to Fast GC analysis and back in a one GC system. The Aviv Analytical Fast GC is now available for its combination with the Agilent 6890 and 7890 GCs and full range of Agilent GC-MS (5975, 5977, 7000, 7010, 7200 and 7250). For further information on our LTM fast GC design and applications please read (or ask us to Email you) the paper of A. B. Fialkov, M. Morag and A. Amirav "A low thermal mass fast gas chromatograph and its implementation in fast gas chromatography mass spectrometry with supersonic molecular beams" J. Chromatogr. A. 1218, 9375-9382 (2011). 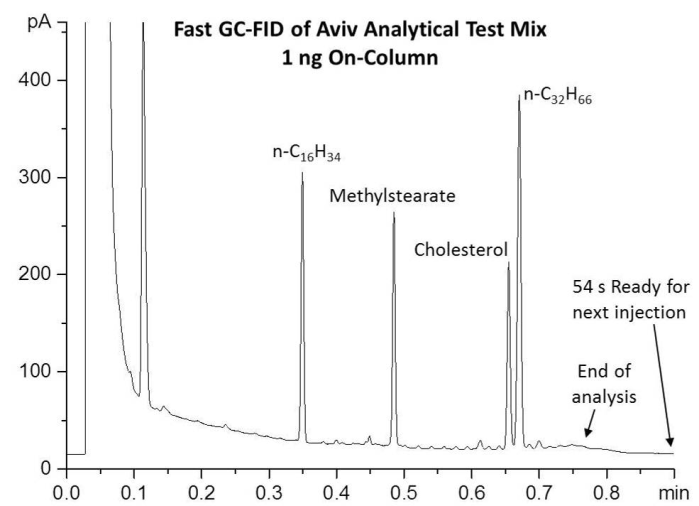 In the figure below the operation of the Aviv Analytical Fast GC is demonstrated in the analysis of a test mixture of n-C16H34, Methylstearate, Cholesterol and n-C32H66 with under one minute full analysis cycle time. 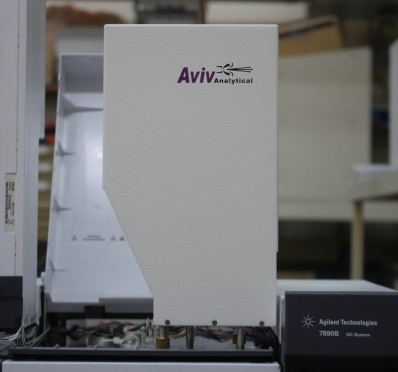 A photo of the Aviv Analytical Fast GC mounted on an Agilent 5975 GC-MS is shown above.